As any devoted motorcyclist knows, a motorcycle offers the rider an experience of freedom and maneuverability that a car does not. While this is doubtlessly true, it is important to remember that it also brings more danger. It is a popular claim that motorcycles are not any less safe than cars, but that’s false. According to the National Highway Traffic Safety Administration (NHTSA), a motorcyclist is five times more likely to be injured in a crash than someone driving a car and thirty times more likely to die. Because of this added risk, it is critical to always keep safety in mind and take proper precautions. Consider some of the following safety measures that are statistically linked with lower crash rates. While riding a motorcycle may seem as if it would be more intuitive than driving a car, every motorcyclist should still receive the proper training to attain his or her license. The NHTSA reports that of 22% motorcycle deaths in 2011, the drivers did not have their motorcycle licenses. Successfully completing the written and driving portions of the test is undoubtedly the first and most important part of becoming a safe motorcyclist. Additionally, a new motorcyclist may want to consider signing up for a motorcycle class through Georgia’s Department of Drivers services. Having direct, professional guidance to learn how to properly operate and maintain a motorcycle can be an invaluable resource. In addition, if a person successfully completes the course, he or she may even be able to avoid taking the written and driving exams, which is an additional benefit. Even if this is not desirable or possible for someone, aspiring motorcycle drivers should still take the time to do research about maintenance habits and how to handle a motorcycle in adverse conditions, such as when there is debris in the road or the road is wet. In Georgia, helmets are always required for motorcyclists. Eye protection is also required unless the motorcycle has a windscreen installed. Helmets are especially important since a substantial amount of fatalities caused by motorcycle crashes can be avoided if the cyclists wear helmets. In fact, out of all motorcyclist deaths in 2011, 40% of the riders were not wearing helmets. Eye protection, either a helmet visor or goggles, is also crucial, because it can keep debris and insects out of a rider’s face. Typical eyeglasses are not large enough or strong enough for this purpose. These articles of clothing should be made of durable material, such as denim or leather, to give protection to the driver. Additionally, clothes should not be baggy, since baggy clothing can hinder a rider’s vision or maneuverability in the wind. Clothing should not have holes, since these would leave the rider’s skin unprotected. While these measures may seem unimportant, keep in mind that motorcyclists are not as protected from external conditions as automobile drivers and riders. It is important that they go to greater lengths to protect themselves. A large amount of motorcycle crashes occur when car drivers are making left-hand turns and do not see the motorcyclist. This is because motorcycles are much smaller than automobiles and drivers are not looking for them. Thus, it is important for a rider to make sure that he or she is highly visible at all times. Wearing reflective gear is helpful for staying visible, especially if riding at night. Additionally, motorcyclists should always make sure that the lights on his or her motorcycle are in working order. In Georgia, it is required that motorcycles have their headlights on at all times while in operation. This can help a great deal with visibility. Upon passing training courses and/or doing research on how to maintain a motorcycle, it is important that a rider continues to use and apply the information he or she has learned. Routinely checking tire pressure and oil levels are some of the basic things that most riders can do for themselves. However, it is also beneficial to have an occasional inspection by a professional mechanic to make sure that everything is functioning properly. A motorcycle that malfunctions while being ridden on a highway can be disastrous, so it is very important that the vehicle always be in good working order. Beyond these crucial safety habits, it is also important that a rider be responsible and aware. For example, it is usually not advisable to drive under dangerous weather conditions, so a rider should always check weather reports before riding to make sure he or she is not caught in a storm. In addition, while riding at high speeds on a motorcycle can be exhilarating, it can also be deadly. 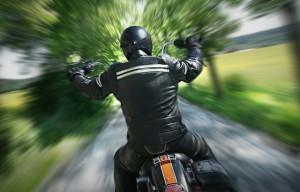 The NHTSA reports that in 2011, 35% of motorcycle fatalities were linked to speeding. Even more deadly may be driving a motorcycle while under the influence of drugs or alcohol. 42% of motorcyclists who were killed in single-vehicle crashes in 2011 had a blood alcohol content at or above 0.8%, and 33% of all motorcyclists killed were under the influence of alcohol. At Van Sant Law, we take motorcycle accidents very seriously. If you or a loved one is the victim of an accident caused by a motorcycle, we ask that you contact our qualified Georgia motorcycle accident injury lawyers immediately. We have the experience and knowledge to help you build a case and receive compensation for your injuries. Fill out our free, no-obligation online contact form, or call us at (404) 991-5950 today.